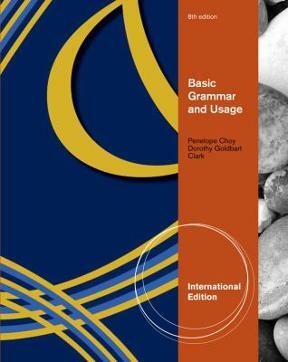 Basic Grammar and Usage, 8th International Edition, help students master the basics of the English language with BASIC GRAMMAR AND USAGE. Covering the important rules of grammar, usage, and syntax, this text provides clear explanations and numerous examples to help students succeed. Exercises help them strengthen their grammar and the book-specific website has grammar reviews that ensure that they master the material.